I am noticing that without me doing anything to cause a change, my blog template has changed. It didn’t use to have the cream colored margins. I don’t like them. If anyone knows how to make them go away, please tell me. In month and three days I’ll be back home my family! Maybe it is the delight of that which has made me much craftier than usual, making more holiday gifts than I ever have before. First done was the Good Luck Cowl. The pattern is available for free from DropstitchKnitter. The yarn is Buckingham, a deliciously soft alpaca/silk mix from Bristol Yarn Gallery yarns. If I were to make it again with this yarn, I’d go down a needle size since my gauge seems to be getting looser which is scary. I love the pattern. It is a fun, interesting knit, so I decide to make another. This time I used the absolutely beautiful Crash Into Ewe yarn with REAL silver that GradSchool Knitter sent to me for winning one of her contests. The photo in no way captures the beautiful color of this yarn. The flecks of silver are subtle but very nice. The skein was enormous so I should be able to knit another. I wish the yarn was still available. It would make it easier to give the second one away as a gift. 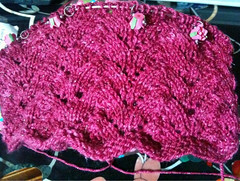 My most ambitious project is the Elm Row Scarf by Anne Hanson. I am finally using some of the JaggerSpun Zephyr Wool-Silk 4/8 – Cone that was part of a group purchase a few years ago. 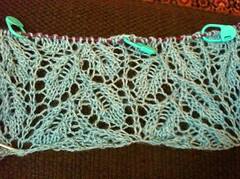 It is my first lace weight progress. 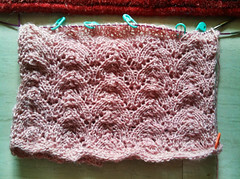 Or rather, it is my first lace weight project on which I’ve experienced much success. Thus far it is going pretty well but I’m really grateful for stitch markers. 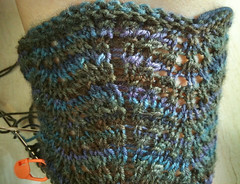 While working on the cowls I didn’t work much on my socks. However, I’ve been in taxis a bit this past week so I’m working on them again. I am enjoying this Waving, Not Drowning pattern. I’ve decided it does work with this yarn. No current photos of my Origami Sweater. I worked on it a bunch a few weekends ago when I was in a four-day workshop. I was really glad no one seemed offended by me knitting. They shouldn’t. I know that I listen much better when I knit something something simple. Unfortunately, knitting is not yet widely accepted as part of our culture at work, despite my careful attempts to change that. What are you knitting for the holiday? Please leave me a comment to let me know. This entry was posted in FOs, socks, WIP. Bookmark the permalink. I finished mittens and clogs to felt so far hope to get two more pairs of clogs and some socks by Christmas. Did I mention the socks are worsted weight.